It's the question that every artist dreads. It's also the one that's asked the most often. Sometimes people ask it out of genuine curiosity. Sometimes they mean it as a compliment - they think the work is exquisite, and therefore must have taken a very long time. Sometimes they're trying to decide how much they're willing to pay for it. This last question is the worst, and one of the reasons that artists don't like to share how long it took them to make something. Another reason artists don't like to share how long a piece took them is that artists don't always track their time, and art is often a non-linear process. A project might be started, stopped, picked back up, "finished," then have additional edits made. Other projects frequently are started and stopped between each part of the process, making tracking time even more difficult. One way some artists answer the "how long did that take you" question with how long they've been practicing their medium, or practicing art in general. In that view, each project adds to their experience and gives them the knowledge of how to make a new project better and with less time spent on mistakes. This answer is a firm way to say, "thanks for your interest, but I don't share that information." It insists that the artist's experience is what gives value to the work, not how long the piece took. It protects the artist's privacy, and keeps the questioner from having an opportunity to devalue the artist's work based on how much time it took them. While I certainly admire artists who can command a living wage for their work, I also feel that fiber art is constantly undervalued by the perception that it's "just a hobby." I cringe when someone tells me they get a dollar an hour for something they made. I get angry when I see people selling product at craft fairs and farmer's markets for low prices, sometimes prices so low that the garment costs less than the yarn/fabric must have cost the seller. In part, we have industrialization and fast fashion to blame. As early as 1840, it became more economical to buy cloth rather than spend time making it. Commercial cloth (and ready-to-wear clothing) has become cheaper and cheaper ever since. As we became divorced from the processes of making yarn and cloth, we stopped appreciating its value. We also traditionally see textile work as "women's work." While the history is a little more complex than it just being work done by one gender, seeing textile work as something done by women, at home, in the time between other household chores makes it very difficult to quantify, and therefore value. Last winter, one of my handspun, handknit sweaters went into the washing machine. The yarn was not superwash. It was an accident, no one was hurt, and I did manage to unshrink it just a little bit. After the initial shock, I joked to my husband that it was an excuse for me to get to go shopping for a sweater quantity's worth of yarn. And then I started explaining how much the yarn would cost for a sweater quantity - up to $200 for wool similar to that sweater. 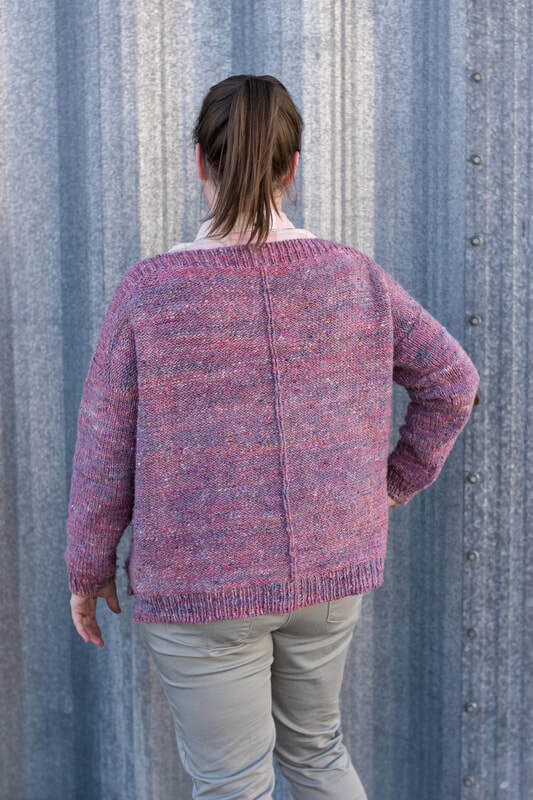 Since it was handspun, the fiber had cost me a little less, but there were hours and hours poured into the making of the yarn, and then knitting it up into a sweater. I just didn't know how many. In my own work, I don't typically keep track of how long something takes me to knit, weave, or spin. It is a hobby, and I know that making things for myself is what gives me the most enjoyment. I do sell some of the things I make, but when I do, I'm always careful to price them so that my time is accounted for and I'm getting paid at least minimum wage. There are a number of other costs to consider when pricing items, like cost of materials, equipment, overhead, and profit if you're trying to run a business. But there's still that elusive question: "How long did that take you?" Carding the fiber took me about 15 hours, spread out over a weekend. Spinning the singles took me about 35 hours, spread out over several weeks. Plying took me about 10 hours, spread out over a week. Finishing the yarn (skeining and washing) took me about 3 hours. I knit all the ribbing on the sweater by hand. Each of the bottom hems took me about 3 hours, as did the short rows and ribbing on the neck. The ribbing on the cuffs took me an hour each. That's a total of 14 hours of knitting the ribbing. I knit the rest of the sweater on the knitting machine. While it is faster, there is a real time and energy commitment to using a knitting machine. You can't just put your knitting on the machine and walk away (at least not on my machine!) and the techniques are a little bit different than hand knitting. In total, I spent 10 hours on the knitting machine with this sweater. Lastly, there's the final step of blocking, seaming, and weaving in ends. It always seems like there are twice as many ends to weave in when using the knitting machine! This step took a total of 3 hours. 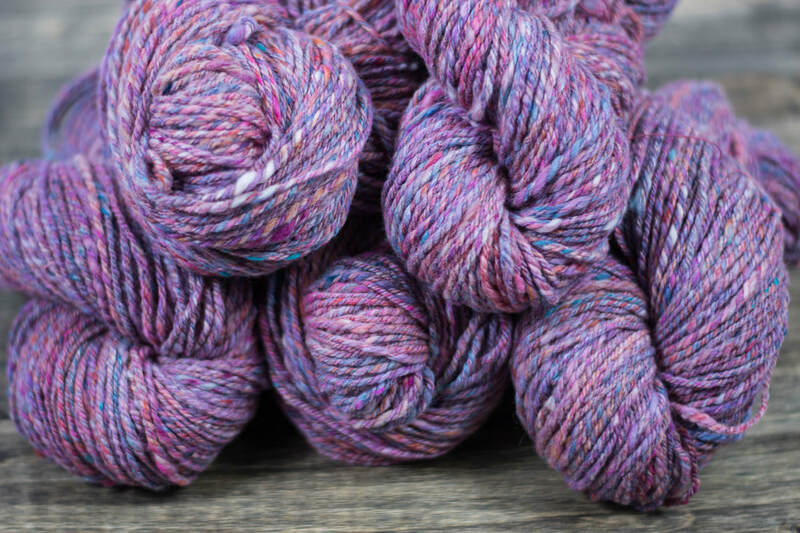 So - the grand total for preparing and spinning the fiber into yarn was 63 hours. The grand total for knitting and finishing the garment was 27 hours. The total amount of time spent making this sweater was 90 hours. So, naturally, the next question is how much is it worth? Where I live, the minimum wage is $11.10/hour. So that's $999 worth of my time. If we were to bump the wages up to what's currently considered a "living wage," $15/hour, the time cost rises to $1,350. I tend to think of my time as a lot more valuable than that - after all, spinning and knitting are skilled forms of labor that not everyone has. But for the sake of this post, we'll stick with $15/hour. 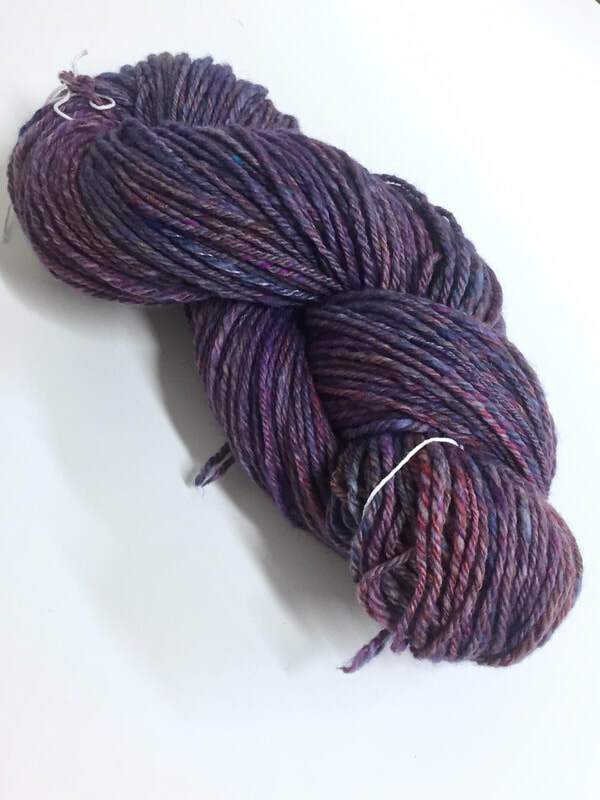 Time isn't the only cost - I used about 30 ounces of fiber, most of it merino, which generally sells for about $5-6 an ounce. There is some silk, yak, and other luxury fiber thrown into the mix, so I estimate my materials cost at the higher end of the range, for a total materials cost of $180. I used a pattern to knit the sweater, which cost me $8. At this point, the cost of the sweater in time and materials is $1,538. If I were in the business of spinning and knitting sweaters for sale, I would also need to account for equipment costs for my drum carder, spinning wheels (I used two in this project), and knitting machine. Based on equipment depreciation calculators and an assumption that the various pieces of equipment are in use 40 hours a week (because we're in business here), equipment cost is about 40 cents an hour. 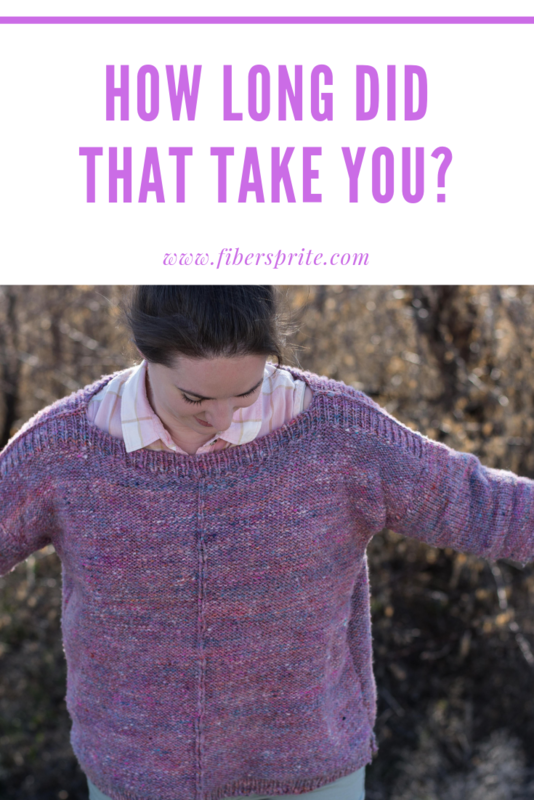 That doesn't sound like a a lot, but when you multiply that by the amount of time the sweater took to make, the cost of equipment is $36, raising the total price of the sweater to $1,574. And then there are other types of overhead - how much does it cost me to rent space, keep the lights on, have running water, and have access to the internet to buy a knitting pattern, fiber, etc.? This is tough to calculate, as many of us say, "oh, the fiber would be in my house anyways," but there is a real cost associated with the space our fiber-things take up. But, assuming that this business takes up 10% of the space in a house where the combined cost of the mortgage/rent and utilities is $1,500/month, the monthly cost of the business space would be $150. Again, assuming this is a job that happens 40 hours a week, the cost per hour (assuming a 4-week month) is 94 cents. For a 90 hour project, the cost of overhead is $84. Now the total price of the sweater is $1658. There are also real costs associated with selling a product - if it's sold online, there are website hosting fees and credit card fees to contend with. If it's sold like a website through Etsy, there's a fee to list it, and there's also a commission that's paid to the website once it's sold. If it's sold at a craft or art fair, there's a booth fee, plus the cost to travel there. If it's sold on commission through a gallery or store, the commission will range from 20-40% of the price. These costs need to be built into the price of the item. Assuming the fees are 20% of the product price, that's $332 for this sweater, which now has a price of $1,990. Last but not least, every business needs to be profitable. Every business has different profit goals, but up to now, we've only been calculating the break-even cost for me to make this single sweater. Profit margins need to be built in to the price of a product so the business can continue to grow. Profit margins also keep the business from suffering a loss if the price of supplies suddenly go up, or the project takes longer than expected to make, or if the overhead increases unexpectedly. Profit margins vary wildly across industries, but 40% or 50% is a pretty common goal. Assuming the lower end of the range, that's about $810 for this sweater, which now has a sticker price of $2,800. So, the next time you go to a craft fair and you think an artist is charging too much, remember that they're real people, with real skills, with real time, money and energy poured into their craft. And if you're tempted to ask the eternal question of "How long did that take you?" please remember that time isn't the only indicator of value. Last Saturday, I finished my Weekender sweater. In my last post, I was all ready to pick up for the sleeves, but I really didn't like the neckline. I tend to not like things right up against my throat. It wasn't that it felt scratchy, as this yarn is super soft, but that I felt like it was strangling me, and I'd be constantly pulling against the neckline for air. Not exactly a recipe for happiness. Plus, the way I'd picked up the stitches at the center front and back looked a little bit sloppy because of how I'd worked them on the knitting machine, so this was an opportunity to fix that as well. I took the 3-needle bind off apart, and undid the tubular cast off. For the back of the sweater, I just needed to re-do the center stitches, so I was careful to pick up all the stitches back onto my needles. For the front, I knew I was going to rip back and take out the short rows, so I let that part be sloppy. Once I'd ripped back, I re-did the short row shaping to make it a scoop neck instead of a classic boat neck. Since that changed my row count, I did fewer rows of ribbing at the front neck so the seams would line up properly. This has the added bonus of making the front and back easy to tell apart when I'm putting the sweater on - which is always the trouble with not having those pesky tags! After fixing the front, I dropped the front and back center stitches down to the ribbing at the hem. In the first iteration, I'd picked up every other row to create the slipped stitch look called for in the pattern. That had looked way too sloppy, so this time I picked up every row, which has a neater appearance overall. Then I was basically back to the place I was in my last post, and proceeded with the sleeves. I made them a little bit shorter than the pattern calls for, since I have short arms. Then it was time to seam and sew in ends! There are a lot of things I love about this sweater. Honestly, I've worn it at some point every day for the last four days. Maybe that's just the novelty of a new sweater, since I did that with the Miss Rachel and the Stashbuster too. One thing that's great about this sweater is the wide neckline - I can put it on and take it off without messing up my hair! Usually a too-wide neckline bothers me, as you can see the shirt people are wearing underneath, and it feels a little bit like a sloppy fit/bad design/teenage nightmare of bra straps showing. But since this sweater is meant to be a relaxed fit, it doesn't bother me at all. Maybe it's time to reconsider my opinion of a wide neckline! I also really like this yarn. One of the biggest questions when undertaking a new sweater project is "how will the yarn hold up?" I don't want to spend a lot of time knitting something only to have the yarn pill like crazy, or feel scratchy when it felt soft in the skein. Because I spun the yarn way tighter than I ever have, it doesn't pill very much. And I think that also makes this sweater warm instead of hot, because there isn't a bunch of extra air in the yarn to help insulate the sweater. That makes this sweater heavy, but in a cozy way and not an oppressive way. There's a little bit of yarn left over - I'm thinking it would make a nice hat and/or mittens to go with this sweater on cold days. I do think I will overdye that yarn before I use it, so that it coordinates with the sweater instead of being super matchy-matchy. Last week I started knitting on a Weekender. I've resisted knitting this pattern for a while for no good reason, and decided that it would be a good way to knit up this handspun. I also decided that it would be a good project to practice working on my knitting machine. I got my machine more than a year ago now, and haven't used it as much as I want to, mostly because of the learning curve. 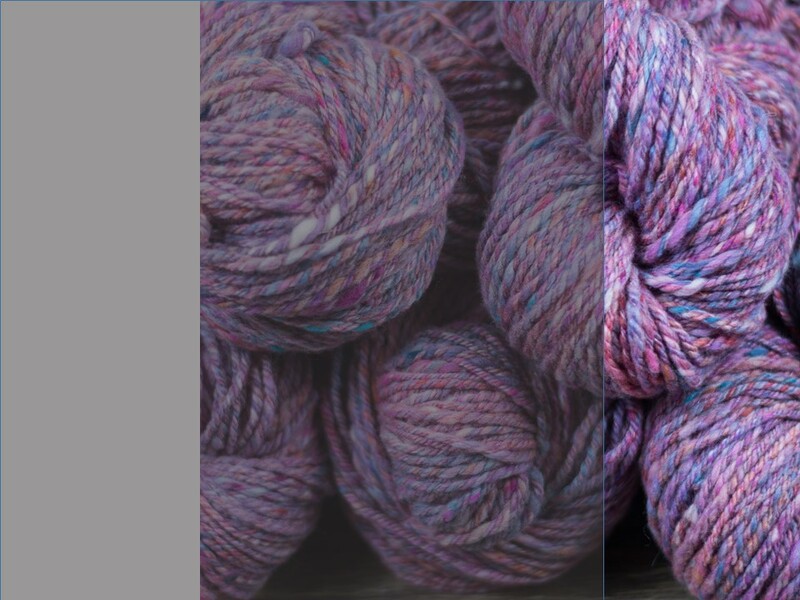 I'd already knit a small swatch by hand, and had an idea of the fabric I'd be making. This yarn is sturdy - tightly twisted and tightly plied, but the merino and silk keep it soft. I reverse engineered that gauge on the knitting machine, and then picked a size based on that. My gauge is a little bit bigger than the pattern gauge, so I went down a size. I haven't been working on this at a breakneck pace. One day I'd do the ribbing by hand, then the next I'd do the machine knitting on one side of the body. Then a couple of days to do the other side. Then a day or two to do the neck ribbing and shoulder bind off. This morning I picked up the stitches for the sleeves, which was a project in itself. Because I alternated skeins every two rows, the little loops that carry up the selveges confuse which stitch is the next one to pick up. And since a lot of people on Ravelry said the sleeves are little bit on the tight side, I added a couple of extra stitches (plus a stitch for the seam). 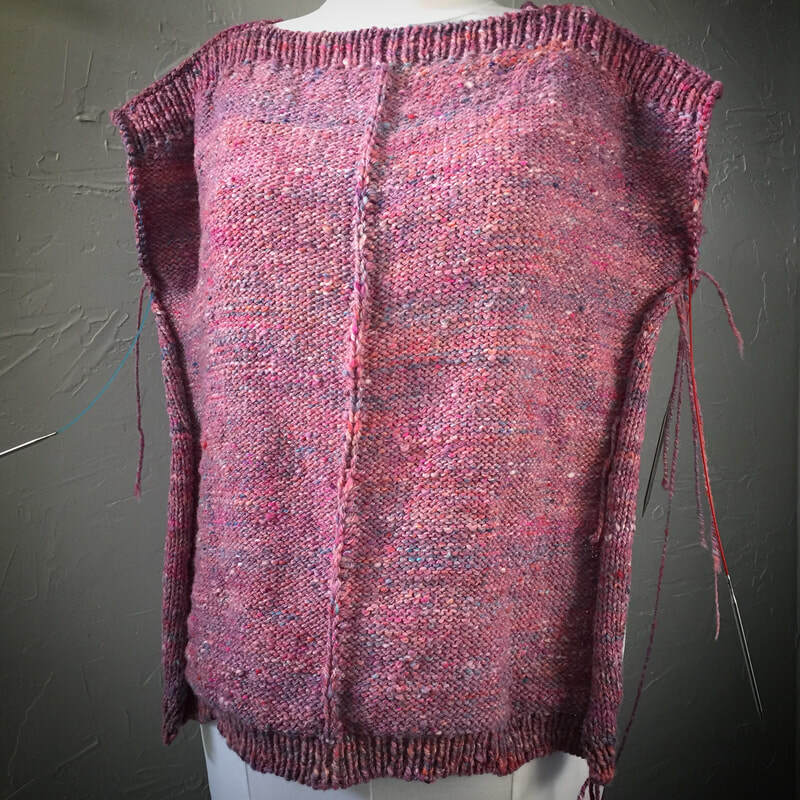 ​Now it's time to hang it back on the knitting machine and knit the sleeves!